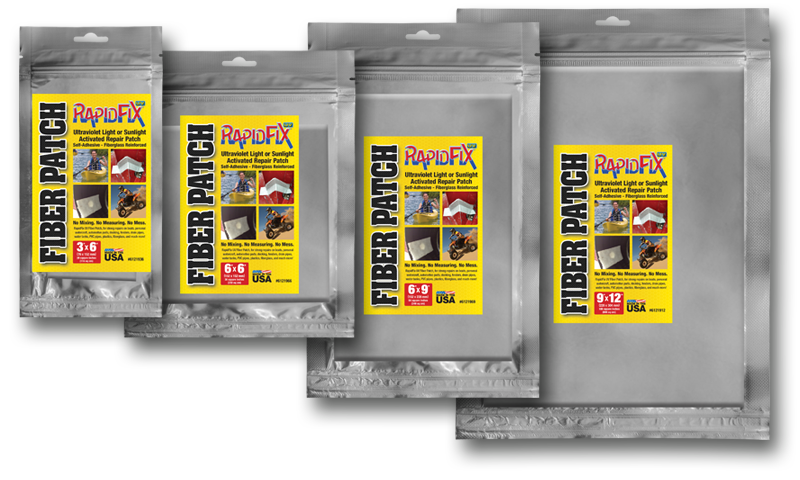 What is the RapidFix UV Fiber Patch? RapidFix UV Fiber Patch is an easy-to-use ultraviolet light or sunlight activated, self-adhesive repair patch. The UV Patch is constructed out of fiberglass reinforced polyester that forms strong, permanent bonds for long-lasting repairs. The Fiber Patch is non-flammable, non-toxic and will not harm skin when exposed to the adhesive. Fast curing time – 5-10 minutes with UV lamp or bright sunlight; 50 minutes on a cloudy day. AUTOMOTIVE Repairs: Bumpers, headlamp housings, metal or fiberglass truck bodies toppers & bed covers, interior/exterior body components of motorcycles, RVs, trucks or trailers. HOBBY, SPORT or DIY Repairs & Projects: jet skis, snow mobiles, canoes, kayaks, surf boards, furnace ducting, roofs, drainage lines, pool equipment, spas, garden equipment and various other surfaces like metal, glass, and plastics. PLUMBING: Repairs to pipes, ducting, metal covers, drainage repairs, fiberglass. INDUSTRIAL: Repair of roofs, tanks, pipes, lines, gutters, switch boxes, power poles, metal or siding, etc. Open the pack, cut to fit repair, seal remainder in the foil pack for future use. Cure with the UV flashlight or sunlight for 5 minutes (50 minutes on a cloudy day). Repairs can immediately be sanded, painted or drilled after curing.